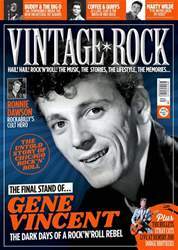 Digital Subscriptions > Vintage Rock > JanFeb 2019 > BUDDY WITH STRINGS ATTACHED! On Sunday 21 October, 2018, walkers on Primrose Hill came across a giant pair of horn-rimmed glasses and the seductive voice of Buddy Holly, wrapped in velvet strings, wafting across the sunny London skyline. The al fresco performance of True Love Ways marked the 60th anniversary of Holly’s final recording session… and heralded the release of a new album that revitalises a dozen of his classic recordings with new symphonic arrangements by The Royal Philharmonic Orchestra. The album was produced by Nick Patrick (Seal, Michael Ball, The Piano Guys) who previously united the Royal Philharmonic with the voices of Elvis Presley, Roy Orbison and Aretha Franklin on a string of hit albums that began with Presley’s chart-topping If I Can Dream in 2015. When you did the Elvis album, was Buddy Holly always on a wish list of other artists to record with the RPO?